Book ANOC World BEACH Games,NOW! Summer Discount, Ask! Location with parking & view! Vacation in a great "above the crowd" apt. in San Diego's South Mission Beach. Vacation, snow birds, executive lodging, visiting nurses, government contractors. Private entrance. Living room & bedroom open to exclusive use deck. Overlook the action of the boardwalk & volleyball, enjoy action of boating channel and Pacific Ocean. Steps to the life guarded beach & surf or cross over to the white sand and smooth water of Mission Bay. Ocean breezes, and the smell of the sea, calm and rest weary travelers who sometimes have too much fun in the sun. Visiting nurses, government contracts, executive lodging, snow birds; discount on 3 + weekly stays with 90 day maximum. What A Place to Come Home to...The Sun Catchers! All bed & bath linens, kitchen needs, paper products, complimentary coffee & tea, non-coin laundry, 2 cable TVs, VCR, reading materials & games. Boogie boards, adult beach bikes, chairs, umbrella, cooler, beach towels provided. We want you to come, relax and enjoy beach living at its best. The Sun Catchers in Mission Beach! South Mission Beach has a unique balance of residential and recreational living. We are a close community with a wide variety of ages, occupations, and life styles on a narrow 'spit' of land without through traffic to other beach areas. This is the cleanest, widest, best of the beaches, neighbors talk with neighbors, and were visitors feel at home. Location, location, location. See the guest reviews and how they feel about our home-away from- home amenities. So many repeat guests must know something is special and thus keep coming back. toilet, shower, Hair dryer, soap and paper products. Relax on tiled bench in shower, shower/water wands make sure no beach sand sticks in sneaky places. Check out the action associated with being in the midst of Mission Bay Park...EVERYTHING on or near the water is offered nearby. The satellite view here shows it all. You want it, we've got it and more. 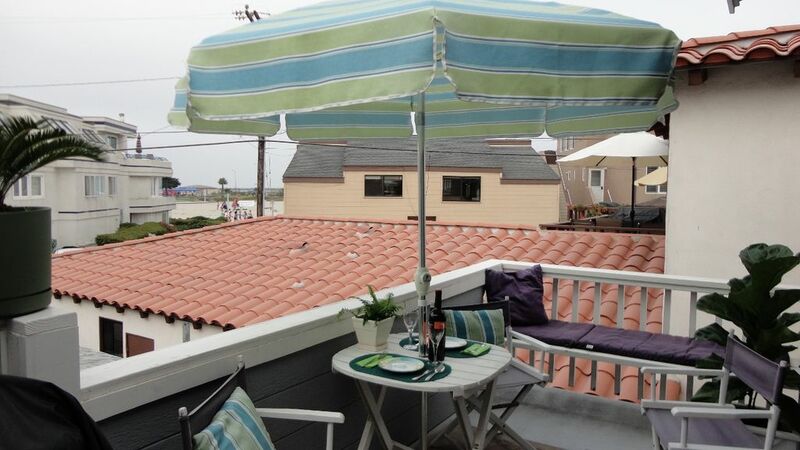 Exclusive use deck with BBQ, bistro set and umbrella, sun bench, VIEW of volleyball courts, and Boardwalk activities. Exclusive use, full fun and great view. The Sun Catchers! Up to 90 day bookings. 1 queen, 1 twin roll a-way, 1 PacknPlay, 1 double sleeper sofa. Steps to the beach, bikes, beach towels, beach umbrella, boogie boards, ice chest, sand toys, Exclusive use full sun deck with gas BBQ, table & chairs, sun bench and view of beach volleyball, basketball courts, grass park and jetty/boating channel entrance to Mission Bay. Complimentary coffee and tea; paper products, in-apartment non-coin laundry. The place was very clean and comfortable. We totally loved our stay! The house was perfect. It is less than a block from the boardwalk. Sandi has thought of everything to make the stay feel like home. Everything you may need to enjoy your stay and the beach were available. We ate out most days but would have had everything to prepare meals if we chose to. Having a parking space available was definitely a plus. It was perfect and hope to return in the future. You were great guests to have here in January and I know you brought the three weeks of super sunshine. Sorry you had to go home to -14 weather, but remember you are always welcome to come back and thaw out. Spacious one bedroom accurately described at bargain price! We really enjoyed our stay at this very nice upstairs property! The home was well stocked with all the necessities for our trip such as coffee, utensils, linens, etc. There was plenty of room to move around the home and the bedroom was especially roomy. My teenage daughter was comfy sleeping in the rollaway twin bed. The sunny deck had a nice view of the volleyball courts and was set up with a bbq ready to use. Sandi was a gracious and generous host who was quick to reply to our questions. I would definitely recommend this home to others and would rent it again! Love this place, the house and the owner! Thanks so much for talking the time to write this review. It is always great to have you here. Your repeat visits are always a reality check for me and puts me in touch with the real world of Texas. This past year was a tough one in many ways and I am so glad you got much needed R & R here. I am glad you know you can always come here for your get-away. Great place! Has everything you’ll need for a week or longer. Excellent location. We love coming here. This was our third stay and will return for more. The location is great. Only few yards from the beach and strandway. The owner/host is awesome. She goes above and beyond to ensure you have a wonderful stay at The Sun Catchers. Can’t wait to go back. I am glad you found The Sun Catchers to your liking. I really appreciate your taking the time to give your positive review here and on the Check-out Sheet. Your grandson was so well-behaved. Hopefully you two can make the trip south again, I'll look forward to seeing him again in the future. You were great guests. Stroll the Mission Beach sea shore, boardwalk or bayside, watch the sun rise and sunset plus Sea World fireworks at night. A short 5 minute walk to the local market, liquor store, eateries and two visitor friendly pubs. Add 2 minutes and a unisex salon, kayak and sailboard rentals. The Amusement Park with indoor pool, tog shops plus blade, bike and boards rentals. Sportsfishing, para-sailing and Sea World are just across the bridge. 15 minutes to San Diego airport, 20 minutes to the San Diego Zoo, stadium, Gaslamp Quarter & Convention Center, La Jolla, universities and Torrey Pines Golf. All rates based on occupancy of 2. Maximum occupancy of 4. All 14 y/o = adult. Refundable deposit includes shared exit cleaning. No weekend party rentals or student "events". Major holidays may be exempt from discounts; may not combine special offers/discounts. Monthly rate may vary depending on holidays within the month, additional parking, and cleaning fees will be applied. Maximum 2 adults on monthly + add'l deposit, fees clean & parking. ***PLEASE NOTE*****Travel insurance is highly recommended due to 30 day non refundable requirement.